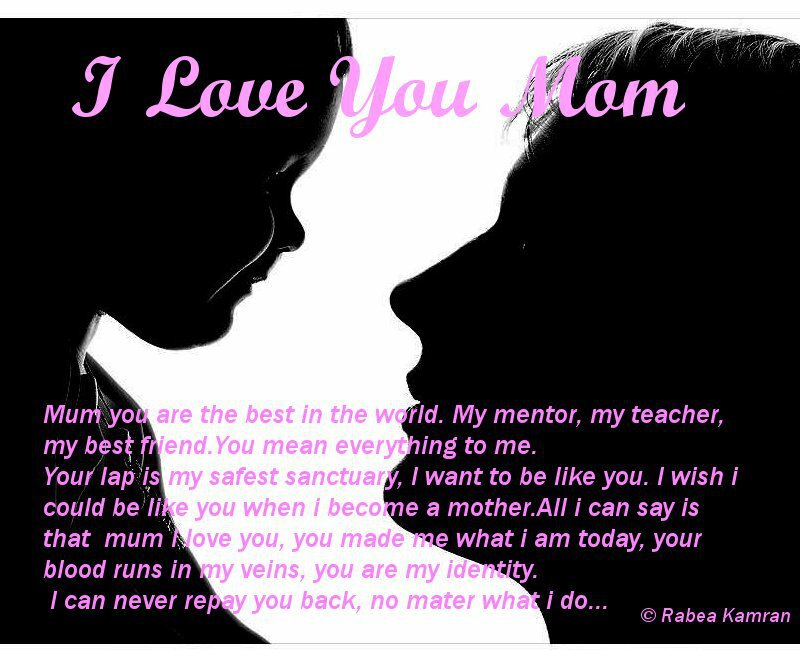 Mum you are the best in the world.. My mentor, my teacher, my best friend... You mean everything to me.. You carried me for nine months, when as a little fetus i was alive in your womb.. When you cared for me, nourished me and kept me safe from every harm.. The day i was born i was crying, but you smiled at me, hugged me close and kissed my cheek, from that time you and i had a special relationship,.. A most precious one..
You would be patient with me when i wouldn't eat, you wouldn't eat unless i have been well fed, those lullabies that you would sing me to sleep, the stories and poems that you taught me.. You introduced me to my religion, myself, my identity. You taught me how to speak, you took my hand and showed me how to walk.. I remember those times when i had jaundice and you would be by my side, awake all night, sponging me with cold water so that my fever would decrease and you would keep praying to God to cure me..
Those times when i would come back from school crying, with bruises on my chin and knees, you cried seeing me in pain.. I still remember the way you would cautiously dab cotton soaked in antiseptic not to make me hurt..
Those times when you woke up with me in exams or helping me with my home work... Mum Thank you is a very small word for everything you have done for me..
Mum you gave my life a meaning, you gave me the self confidence which swells my heart with gratitude.. Mum i am sorry for those terrible times when i disagreed with you or raised my voice against you.. What was i thinking??? There's nothing like a mother's love. mommmy the most beautiful creature on earth... Literally pure and divine.